How do I make cliffs? I'm trying to make clifffs. But if I flatten to foundation, it only makes a ledge. Not a cliff...it makes an overhang with empty space beneath it. How do I flatten ALL terrain under the brush, instead of just 15 feet under the brush? I made some cliffs back in Alpha 3 and if I remember rightly I dug a hole out with the general push tool, then flatterned to foundation inside the hole (the bottom of the cliffs). Then I used roughen and added rocks to make the cliffs rockier looking. Yeah, I can make them sunken into the ground, because the ground already exists. But I can't make them above the base terrain. You can pull out a pile fo dirt, but when you flatten it, it makes floating islands and overhangs with no connection to the ground. You make a mountain with the raise tool first. You know how to do that. Just click and hold. I just played around in a video. Perhaps this will give you a few ideas. It is not rising the ground from the base level up when I flatten, like in your video. It is creating overhangs. It does not bring the ground up with the overhang. You can see when I go around to the back side of my hill, I click on the top and them move quickly down to the lower ground. If done right, it will fill in all the space. It takes a little practice. Another option is to make your cliff in stages. Go half way the first time, then the rest in another pass. Even a third pass if needed. If you point is there should be a better way, I won't argue with that. But there are ways to work around the limitations. I've always found that if you raise with the "pull tool" and then utilize the "Flatten to SURFACE" tool on the top of the hill you created, you can make cliffs with however large of an overhang as you'd want. The trick with the flatten to surface tool is to make sure you keep the tool level (horizontally) before you use the tool. Ugh, this is super counterintuitive. No matter what I do I have to switch to a second tool to get things to look how they're supposed to. Agreed, it's not like it was in RCT where it auto created mountains and cliffs with their respective tools. The tools that we have now feel more powerful, but there could be a few very handy tool additions to the terrain editor (mountain creator, cliff creator, plateaus, etc like in RCT3) to make what we have now that much better. It would be good if we could specify an orientation for our flattening tool and lock it to that! Then we wouldn't need both the flatten to surface and flatten to foundation tools. You can't seriously be complaining about the terrain tools of this game, in THAT way? Some valid complaints I see are the interaction with rides, shops, and paths. Other than that, it is the single handed best terrain tool in any videogame, and you're complaining that you can't make a cliff with only one tool? What criticism is that? Yes, but it should be a completely separate tool, rather than removing a standard option like "Actually flatten the ground". Right now, the flatten button is "Create a flat surface that, if you're lucky, has a base that meets the ground, but usually doesn't". RCT1 Flatten Tool- Creates a flat surface with ground all the way underneath it. RCT2 Flatten Tool- Creates a flat surface with ground all the way underneath it. RCT3 Flatten Tool- Creates a flat surface with ground all the way underneath it. The Sims Flatten Tool- Creates a flat surface with ground all the way underneath it. The Sims 2 Flatten Tool- Creates a flat surface with ground all the way underneath it. The Sims 3 Flatten Tool- Creates a flat surface with ground all the way underneath it. SimCity 2000 Flatten Tool- Creates a flat surface with ground all the way underneath it. SimCity 3000 Flatten Tool- Creates a flat surface with ground all the way underneath it. SimCity 4 Flatten Tool- Creates a flat surface with ground all the way underneath it. Cities Skylines Flatten Tool- Creates a flat surface with ground all the way underneath it. 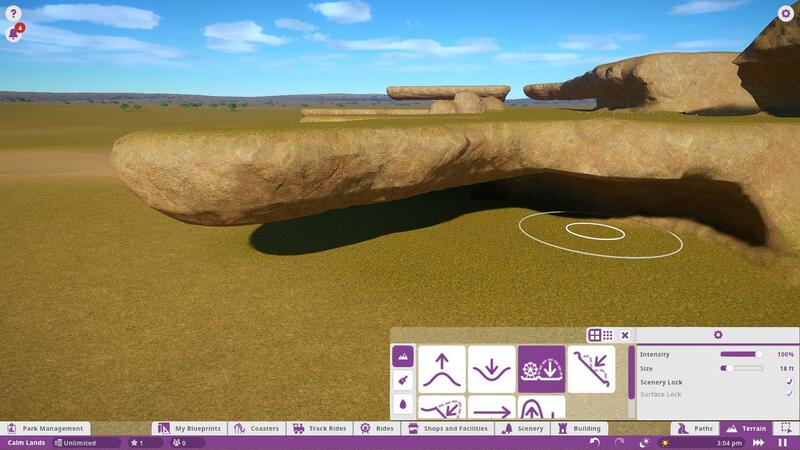 Planet Coaster Flatten Tool- Creates a flat surface where the ground is not all the way underneath it if the surface is too high up, forcing you to clumsily pull terrain up from below with the pull tool, or use a surface flatten tool to create a wall of terrain that doesn't actually fill in the surface you're making but just makes an outer edge aroun it, and fiddle iwth it to get the right shape you want, and then if you want to flatten more land or extend your new plateau outward, you have to repeat messing with various tools to get a rough approximation of what every previously listed tool could do in one step, with one tool. I don't think the previous tools worked that way entirely out of necessity (those games could not have overhangs!). if those games also had overhangs I would like to assume they'd have a means to flatten terrain and also ensure it has a base at the same time. There, you've answered this one yourself. Doesn't this look like the common denominator in the cliff-makeyness of terrain tools throughout the ages? Personally I find that a combination of the Flatten to Foundation and the Flatten to Surface tools are great for making cliffs like you are asking for. Yes, it's maybe not as easy as those games that you listed, but its certainly more powerful without a doubt. I covered that in the post. No, those games could not have overhangs. But even if they could, I would imagine they would have had a flatten tool that works the same as the ones they already have. Surely somewhere along the past two decades one of these kinds of games would've realized one was a necessity. Even if they could have overhangs, that doesn't mean it's reasonable for PC to not be able to make plateaus using the flatten tool, like every other game I can think of that has terraforming. Adding a new feature is not a very good explanation for lacking an old one. :\ I can't make terrain the same as I can in any other game I own with terraforming, even though PC's terrain tools are more advanced and better, and that's a problem. The Mountain tools from many of those games are also missing. Pull can create something similar, but it won't create a peak with a sloped base all around it. You have to do that part manually, and it's just clunky. They added 3 dimensional terrain movement, but forgot the basics, I think. Making the kind of terrain I want to make right now is worlds easier in RCT3 than in PC. There's tools to make the slopes instantly, there's tools to make raised areas with sloped ascents instantly, there's tools to cut away an edge instantly. PC is more powerful for sure but the tools used are also more obtuse and there's a few missing. Sounds like a good one to me. A cliff seems like a pretty basic/standard type of terrain you might want to make. So it should be simple to do. It might not be a huge deal, or even in the top 10 of things things that need improving. But that doesn't mean it's not worth mentioning. Shouldn't you want any and all issues pointed out, regardless of how small? It's the best way to notify the devs and make the game better. The terrain tools are powerful but certainly not perfect. If you use the flatten tool to get to your base ground level and you start on a spot that is raised even a milimeter, it's a mess. I wish you could specify a height to raise/lower/flatten to so you could be precise in any location.